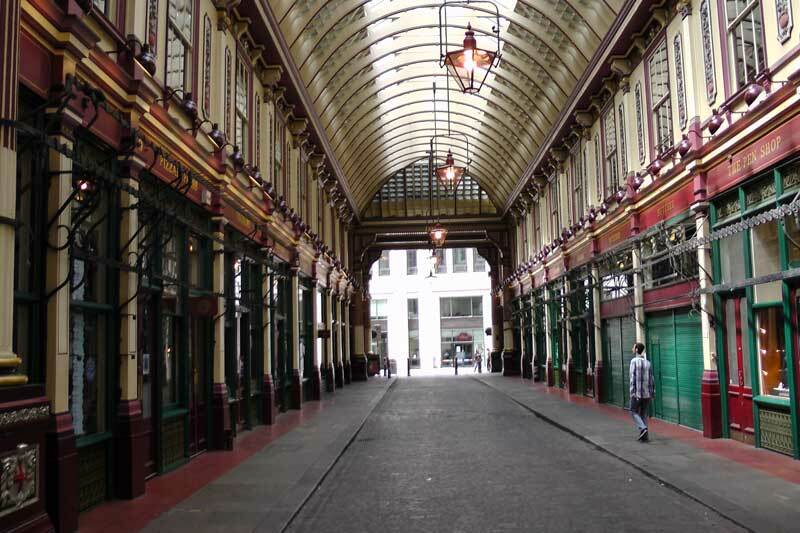 The Harry Potter London Tour - The Original Free Walk. 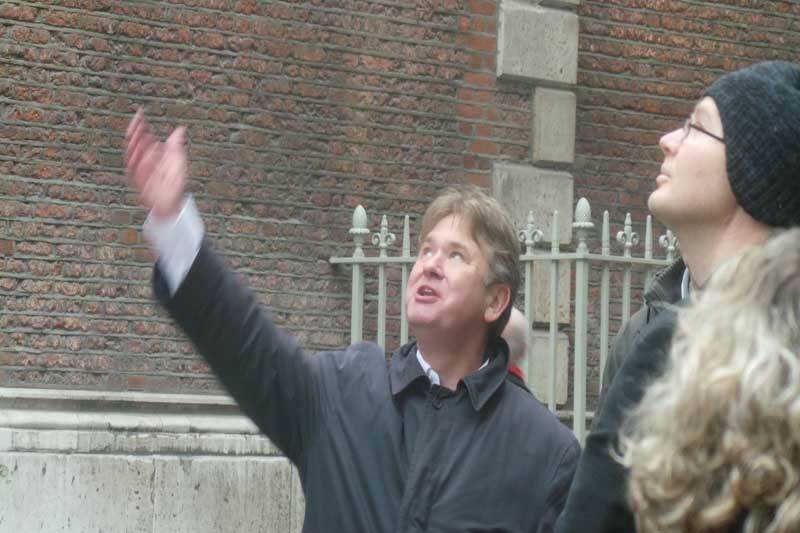 Welcome to the Harry Potter London Tour, brought to you by London Blue Badge Tourist Guide and author Richard Jones with the intention of providing you with a free DIY walk that will enable you to explore some of London's hidden away and most fascinating places at little or no cost. 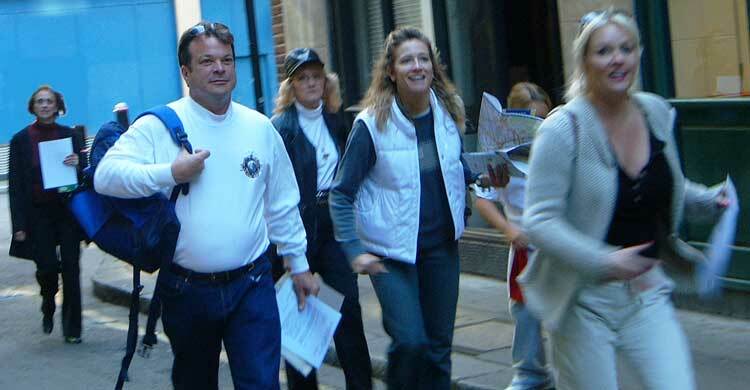 The tour is a free downloadable, print and go self-guided tour. You simply download the PDF, either print off a paper version of it, or have it on your phone, ipad or tablet, and then head out and follow the detailed step by step directions. It is set out in section, each of which can be done as a stand-alone tour of a few hours, or else combined to create a full day tour that will take you all over London. Because it is a self-guided tour, you have complete control over how and when you do it. You go at your own pace, enjoy all the things that you want to enjoy, and, best of all, you get to take a break when you want to take a break, not when a set tour schedule says you can! A fun and interesting way to explore London. There are lots of Harry Potter tours on offer in London - and the prices range from manageable to exorbitant, whilst the quality varies. Even the so-called "free" guided tours are not actually free, since the guides will be pressurising you to tip them throughout the tour, and you'll end up forking out around £20 or more for a service that is advertised as "free", which, if you think about it, is somewhat misleading, the sort of stunt Tom Riddle might have pulled! Richard Jones's free Harry Potter tour, on the other hand, is exactly what it says it is - 100% free. Then there are the paid for tours, some of which will cost you upwards of £400 for a family of four, whilst, even the low cost London walks will set you back £26. But, why pay to go on a scheduled tour of the Harry Potter locations? By doing it yourself you will not only see all the locations (and many more besides) that are covered on the paid for tours, but you will also save yourself a great deal of money. Why throw money away, when you can do it yourself for free? The big worry people have about going it alone is that they might get lost. But you don't have to worry as you get very detailed directions that will guide you step by step around every twist and turn on the tour. 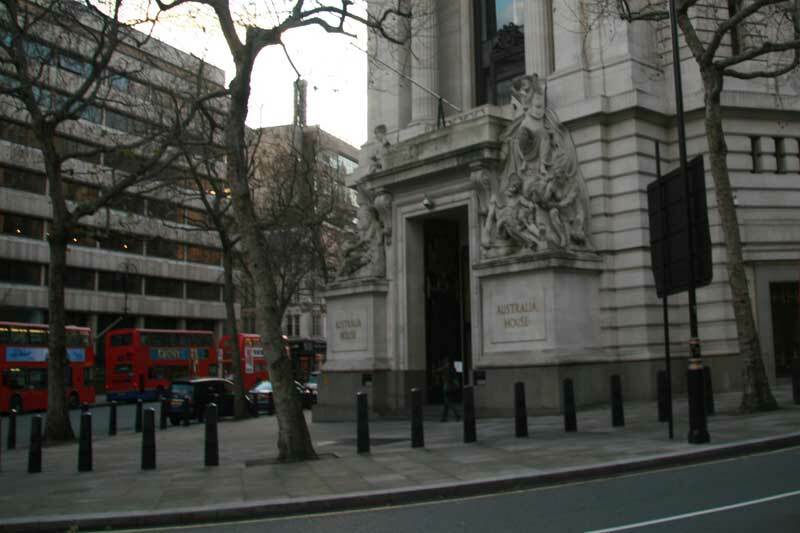 The tour is devised to be undertaken on foot and by bus and tube, and thus you are provided with step by step directions to enable you to find your way around London. The directions are extremely easy to follow. They tell you which local landmarks to look for and head towards and tell you when to turn left and when to turn right, thus ensuring that you are guided every step of the way. They even tell you which underground station to get on at, which one to get off at and they guide you around hidden streets and secret places on a series of fascinating walks that will introduce you to some truly magical places. They were paced out by walking the route with a camcorder whilst both filming and dictating the directions. As a result the instructions you receive are extremely detailed and have been thoroughly tested to ensure that you, quite simply, cannot get lost! 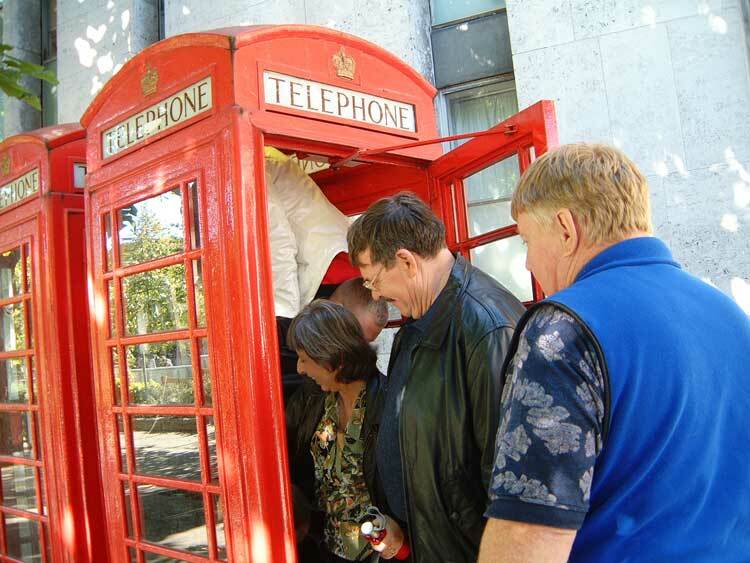 The staff entrance to the Ministry of Magic was located here. 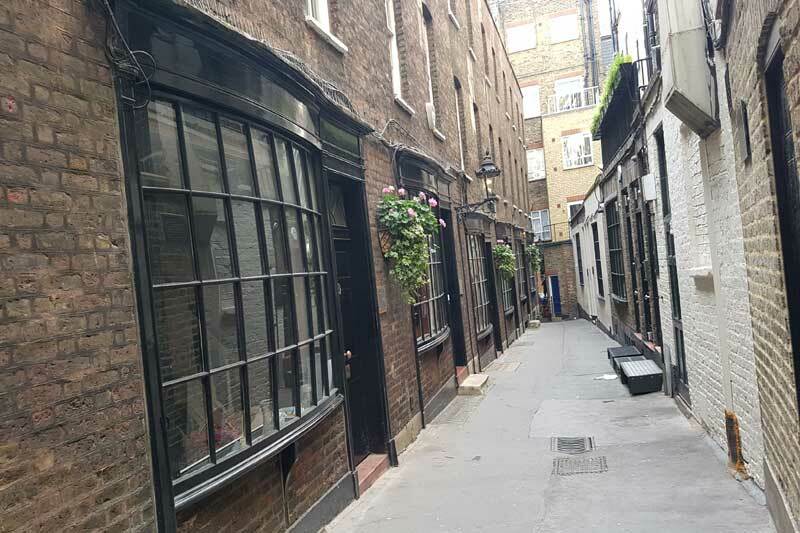 As well as exploring the streets of London, you'll also enjoy the opportunity to step inside some of the locations that you will encounter en route. How about, for example, trying to dodge the Death Eaters at several locations where Harry, Ron and Hermione encountered them? Or, standing outside the exact doorway through which Harry and Hagrid entered the Leaky Cauldron. 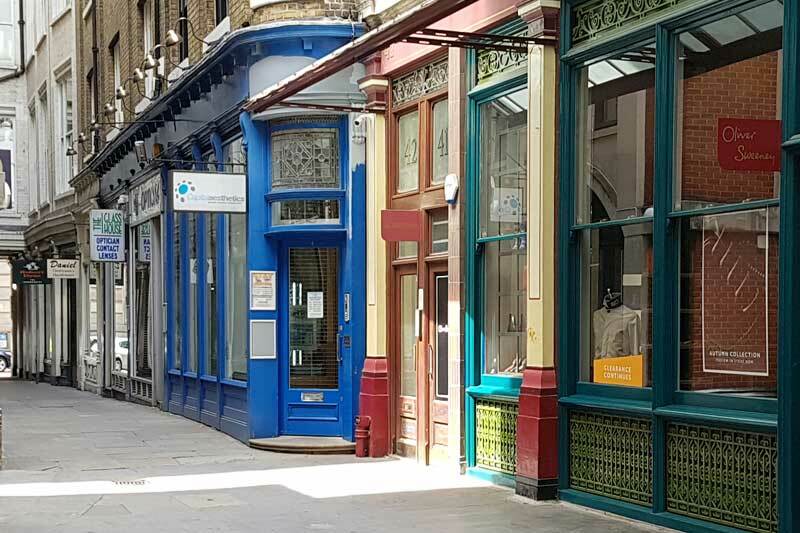 Then, there is a shop, hidden away from the main London thoroughfares, that was set up by two graphic artists who worked on creating several of the magical props used in the Harry Potter movies. It occupies three floors of an old 18th century property and, to be honest, it would be more at home in Diagon Alley than in the backstreets of London. But it's there, and you can visit it, and Diagon Alley's loss is London's gain. All these treasures await your discovery on a tour that will, most certainly, fill the unforgiving minute with sixty seconds worth of distance run! 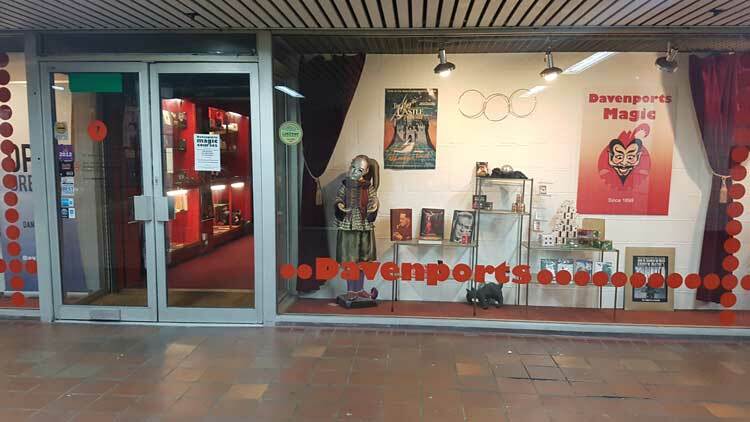 You'll visit this magical shop on your Harry Potter tour. As you can see from the above sections, the Harry Potter London tour is extremely detailed and features almost every film location that has been used in the films. They're all there - the Leaky Cauldron, Gringotts Bank, various mysterious ways to get into Diagon Alley and the staff and visitors entrances to the Ministry of Magic. But, since you'll be passing some fascinating segments of London's rich and vibrant history - a medieval ferryman's stool, the time-scarred ruins of the former residence of a Bishop, a 12th century well, 19th century demons that scowl down on passers-by below from their lofty perch, high up on a City rooftop, to name but a few - the tour will also be a voyage of discovery which will leave you not just having visited the Harry Potter locations, but also many other historic locations around the Capital. 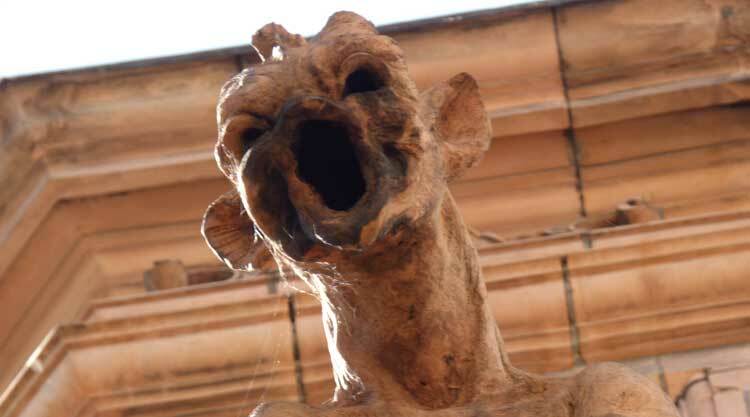 One of the Cornhill devils. 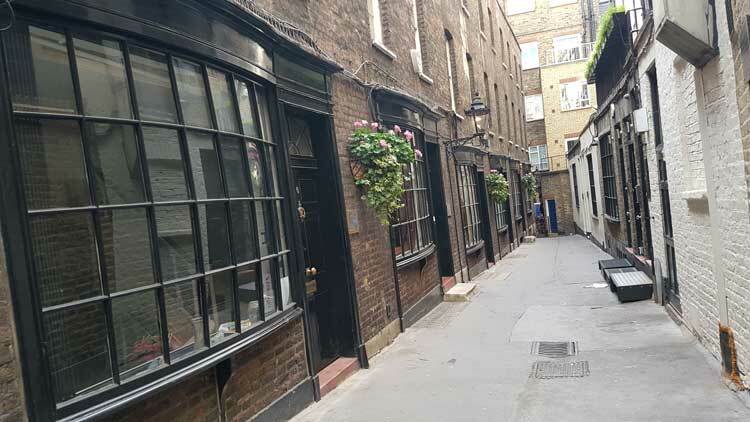 The tour is divided into easy to follow sections that guide you through the streets of London and each section of the tour ends at a Harry Potter Film location. Breaking it down into sections, as opposed to publishing it as one complete walk, means that you can choose the best way to do the tour in a way that suits your needs. So, you can either spend the entire day doing the Harry Potter walk, or you can spread the sections out over several days, weeks, or even months! And, if time is limited, you can select which film locations are most important to you, and then focus on the section of the tour that features just those locations. Bank Station To The Leaky Cauldron. The Leaky Cauldron To The Leaky Cauldron! The Order of The Phoenix and the Half Blood Prince. Harry Potter Tour St Paul's to Gringotts Bank. 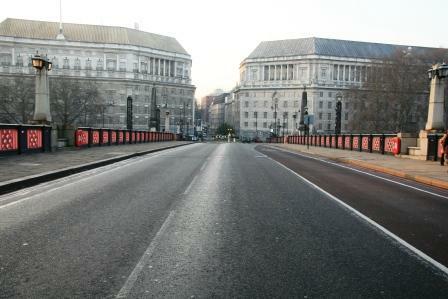 Lambeth Bridge and the Knight Bus. The Ministry Of Magic And The Deathly Hallows. The Inspiration For Harry Potter's Diagon Alley. 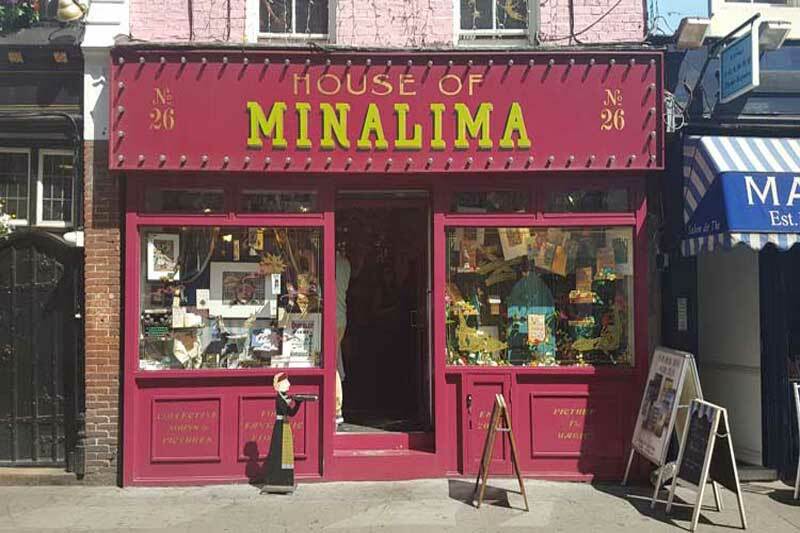 The Magical House Of Minalima. To Piccadilly Circus For The Deathly Hallows. 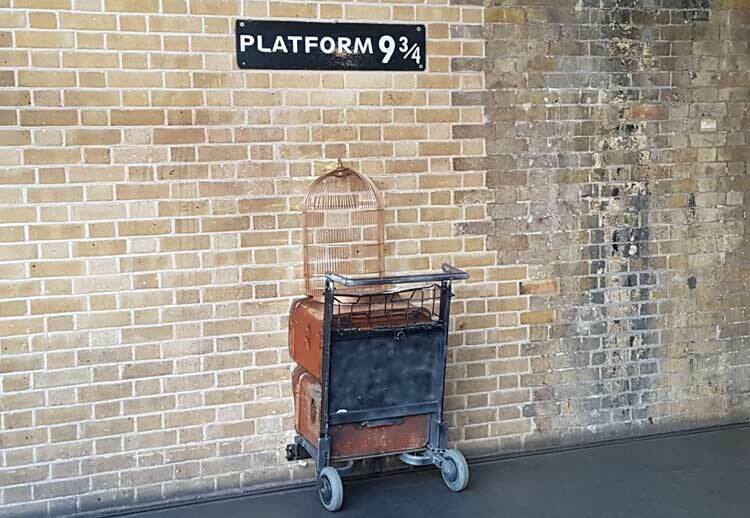 A Visit To Platform 9¾ At King's Cross Station. The Harry Potter London Quiz And Treasure Hunt. Harry Potter Trivia And Interesting Facts. Guide To The Harry Potter Film Locations. The Harry Potter Tour and London Treasure Hunt has been structured as both a London tour and a London Treasure Hunt that is intended to be both informative and entertaining. 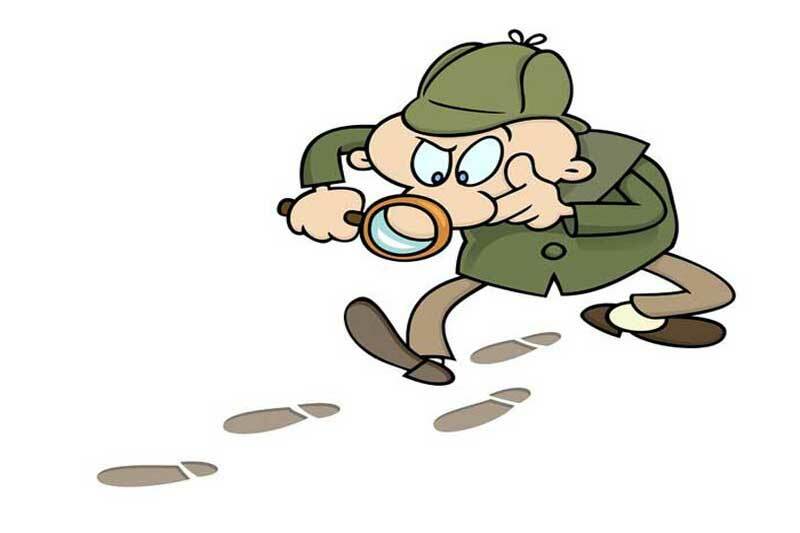 So, as you are walking around, you will be set tasks to do, such as finding hidden pieces of street furniture or answering questions using the information that is found on plaques and information boards. And, in addition, you'll also be set the challenge of acquiring photos of yourselves at many of the magical locations that you will encounter as you make your way around London. That way you really do get to not just see London but to also uncover it! Not only will parents be able to discover some wonderful parts of London, but the children will be kept occupied and interested searching for particular items, such as bits of street furniture, statues and so on and so forth. The whole day becomes a true adventure as you make your way around the streets and Harry Potter film locations around London. There will be a number of tasks that they have to perform, such as looking for the rats tails in the London church on which the rhyme Oranges and Lemons was based. They will have to find various animals (or at least statues and models of animals) as they travel all over Central London. Also, given that the theme of our tour is a magical one, they will be able to stop off at a famous Magic Shop where they can both watch resident magicians perform magic tricks for their delectation and buy simple magic tricks that they can perform for their friends and family when they arrive home. 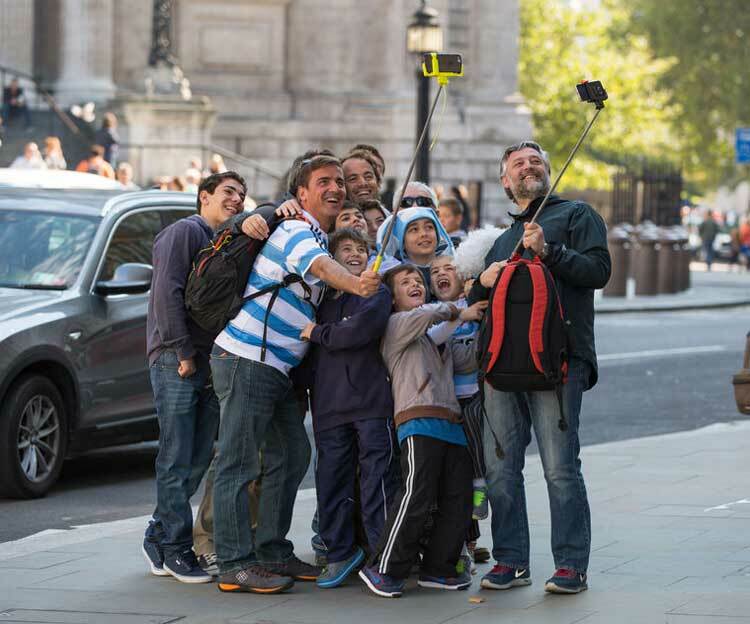 So not only is this a DIY London Tour but it is also an engaging London treasure hunt that will hold the children's attention throughout the day. You'll visit the world's oldest family magic business. Of course the main idea behind this magical tour is to enable you to visit the Harry Potter Film Locations and all of the ones in Central London are covered. You will be able to take your children to the entrance to Gringotts Bank; board a train at the underground station that featured in The Order of the Phoenix; stroll along Diagon Alley in the footsteps of Harry and Hagrid; and see the entrance to the Leaky Cauldron (well in fact two entrances, as two different locations were used!). 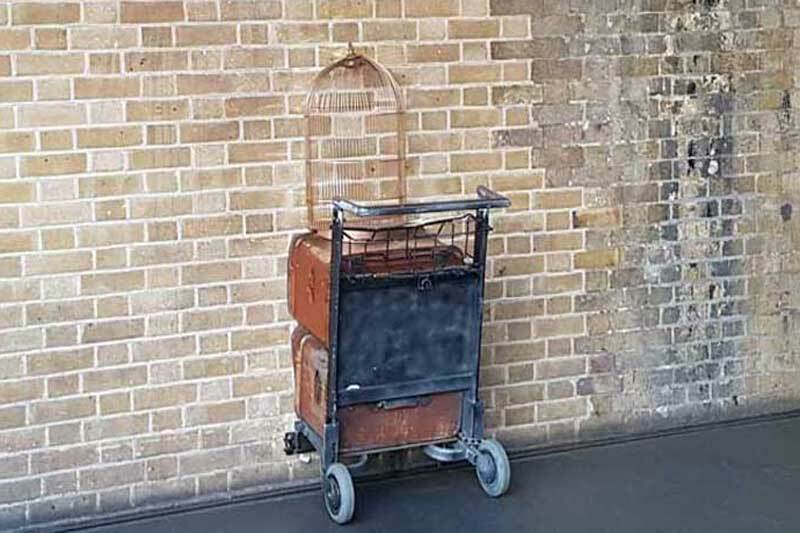 Last, but by no means least, you will be able to visit the entrance to Platform Nine-and-three-quarters, where a luggage trolley part embedded in a wall makes for a great family photo opportunity! Although aimed primarily at families with children, the free Harry Potter tour has, over the years, been enjoyed by young and old alike. Groups of friends have used it to enjoy a fantastic day out in London, whilst Hen Parties have made use of it to add an extra element to their celebrations! In addition to the Harry Potter locations, the tour also features many of London's famous, and lesser known, landmarks, so if you are not a fan of the boy wizard, worry not and there is plenty on the tour to occupy any muggles amongst your group! You'll recreate scenes from the Harry Potter films. The great thing is that you can do the walk at your own pace and in your own time. You set the time, the pace and, most important of all, exactly how long you spend at each stop that you visit on the tour. 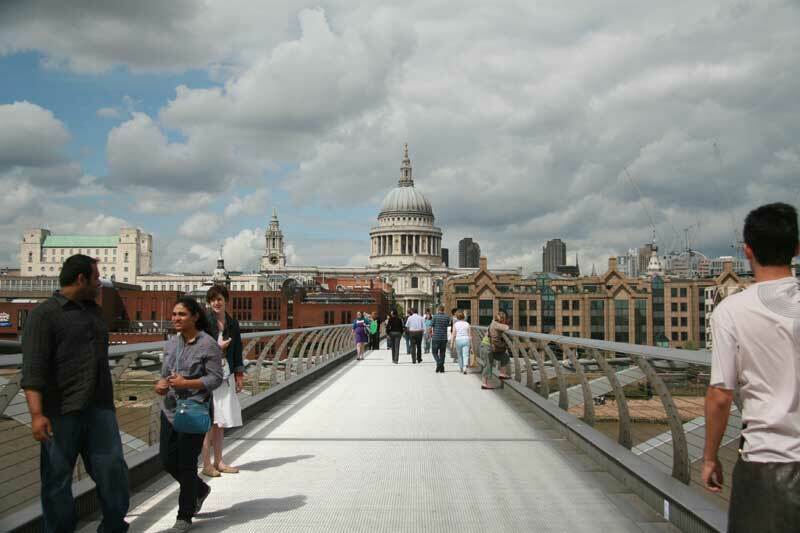 You are not crammed on to a walk with 50 or 60 other people, you are in the company of your own family and/or friends and are thus able to explore London at your own pace, spending as little or as long as you choose at each site covered. If you get tired, run out of time or, perish the thought, the kids get grumpy, simply give up for that day and return another day. The beauty of this DIY Free London Tour is that you set the agenda, you are in charge, so you can decide when to stop for a coffee or a bite to eat, or even when enough is enough. Speaking of which, enough of the pre-amble! Hopefully you've now got the gist of what this is all about. It is a free tour that will take you all over Central London (an Oyster Card will prove most useful). So if you are ready to discover a totally different side to this magical city, wave your wand (or better still click on the "begin the Harry Potter London Tour and London Treasure Hunt' below) and prepare to enter the world of wizards and magicians. For up to date information on London, to ask questions, or to seek the advice of other Free Harry Potter Tour participants, come and join Richard on his Facebook Page. You can also message Richard with any questions about the tour via this page. WHO KNOWS WHERE TO GO! To be honest, the free Harry Potter tour is easy to follow and it can be done without a guide. However, if you would prefer to have Richard, or one of his colleagues take you around, then this can be done as a half day or as a full day tour. With your own guide, you can tailor the day to your exact requirements. You can, for example, mix and match the Harry Potter locations with visits to other London locations, such as the Tower of London, Westminster Abbey, or St Paul's Cathedral. You can even mix and match the themes on your tour, adding, for example, a few Beatles locations, or Roman or Tudor history, or even a few haunted locations to add a spooky, fun element to your tour. In short, your own private guided Harry Potter tour can be anything you want it to be, leaving you free to just relax and enjoy your day in London. In fact, to borrow from Hagrid's memorable observation, there's so much to see and do in London - "If you know where to go." HOW UP TO DATE IS THE TOUR? The tour was last re-walked on January 30th 2019. 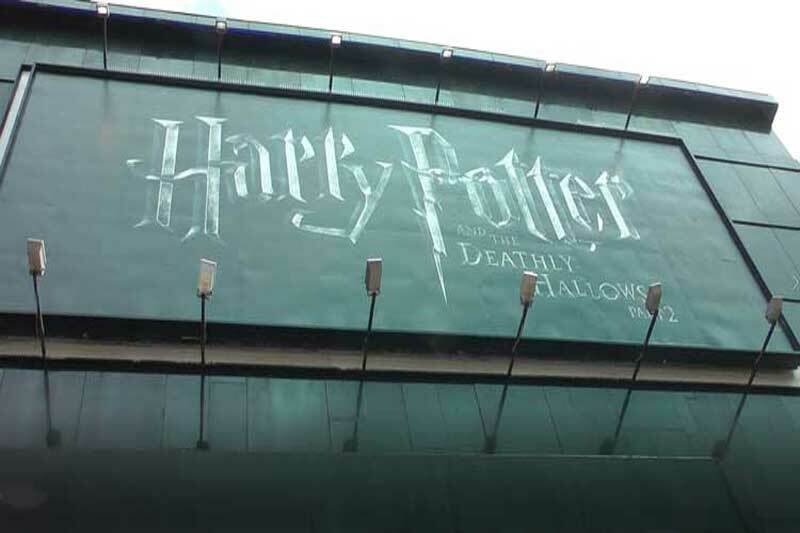 The Harry Potter London Tour is a self-guided tour so you choose the day and the time you wish to do it. 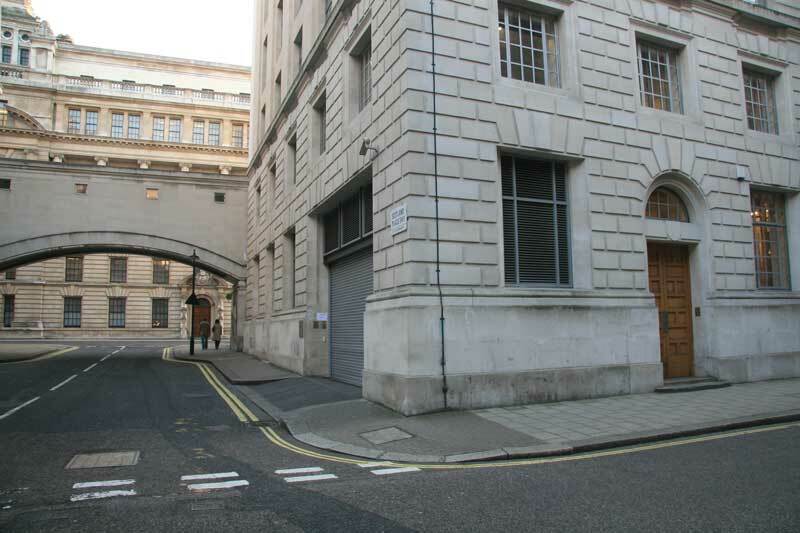 The full Harry Potter London walk starts outside Exit Three of Bank Underground Station. However, you can begin the tour at any point along the route. The Harry Potter London Film locations tour is completely free. There is no charge other than your travel costs by bus or underground. The Harry Potter Walking Tour can be done, at a push, in one day by starting at 10am and ending at 4pm. However, it is probably a better option to take your time and spread the Tour over two days. It is a Harry Potter Walk all over London so there is a lot of walking involved. However, since it is a self-guided walking tour, you can go at your own pace and there are lots of places to sit down and rest en route. There are lots of cafes, restaurants and pubs along the route. There are also several parks to stop off in, should you wish to take a packed lunch with you. 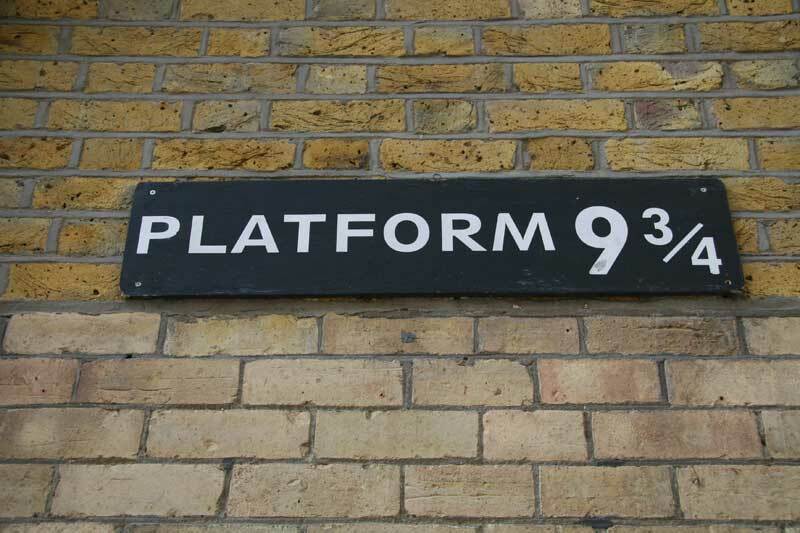 The Harry Potter Tour of London ends at Platform 9-and-three-quarters at King's Cross Railway Station. I put the Free Harry Potter London walk together after taking my children for a day out in London and ending up paying an absolute fortune. 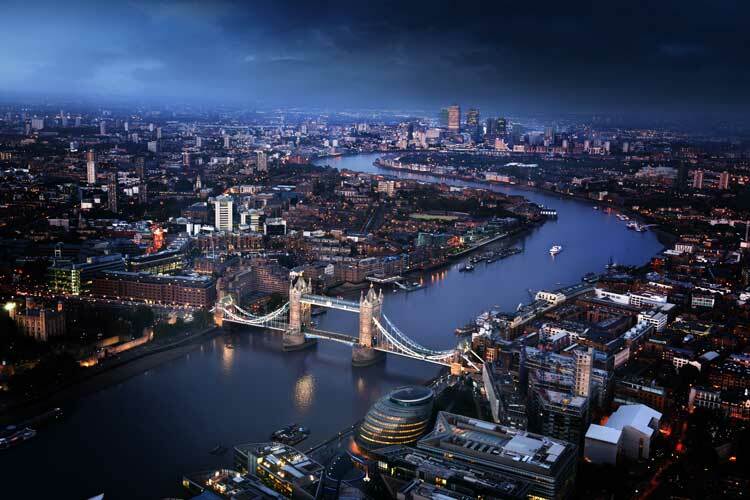 As an experienced London Guide, who has written many books on London, I knew that there were lots of places that people could see and visit that cost nothing or, at least, next to nothing. 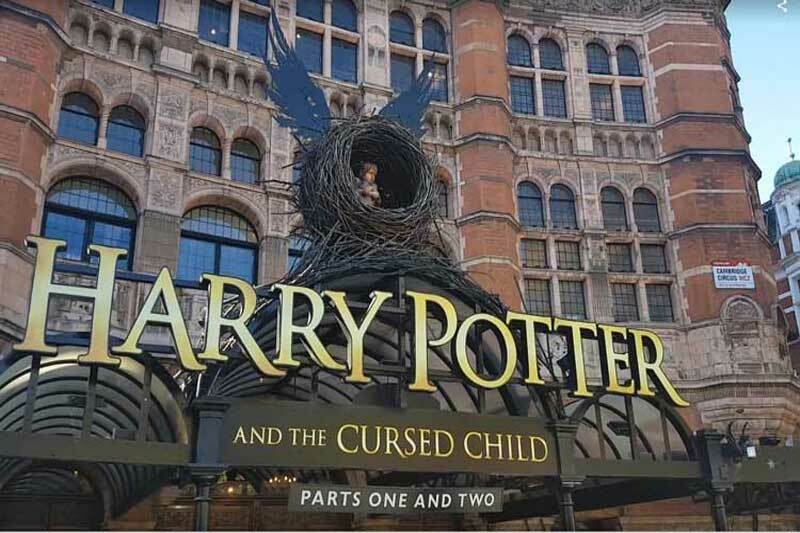 So I decided to put a tour together for families that was themed around the Harry Potter films, but which would also give people the opportunity to have a great day out in London at very little cost. I was also very conscious that a lot of companies were charging people a lot of money to take them around the Harry Potter London film locations. I just wanted to do something that would enable people to be able to visit the sites when they wanted to and not have to take out a second mortgage to do so! So I wrote the Harry Potter London Tour and began offering it as a free PDF download. It's proved hugely popular since, and lots of families have emailed to say what a great time they had on my Harry Potter Tour and how easy it was to follow. Although our "kids" are now young men, and have flown the nest for university - my wife and myself still enjoy walking around the route once a month with our energetic border collie, Freddy, updating the tour (us, not Freddy doing the updating) and putting in any additions that catch our eye. SOUNDS GREAT HOW DO I GET IT? Getting the free Harry Potter London Tour is simplicity itself. Just click on the "Download Now" below and, as if by magic, the PDF of the tour will fly back to you! Richard also conducts the original Aldgate East Jack The Ripper tour, a walk that explores the crimes that shook polite society in 1888. “Thank you, thank you! My kids and I did (part) of your walk just before seeing the Harry Potter movie, and while the HP stuff was interesting, the walk was entertainment in itself. A great wander through a part of London we haven’t discovered – a really memorable part of our summer. I just wanted to let you know that your tour made my trip to London such a fun experience! My best friend and I absolutely loved wandering the city, finding little Harry Potter treasures along the way. We also really appreciated that you included other sights we passed such as Chris Wren's house and the random Ferryman's stool. We never would have known about them otherwise! Thanks again so much, we really appreciate the effort you put into this and wouldn't have had as great of a time in London had it not been for your tour. My family and I did part of your Harry potter walking tour in London on Sunday. The highlight of the tour was when we turned down the street where the exterior of the Ministry of Magic was filmed. By chance we happened upon a film crew who was filming Harry Potter and the Deathly Hallows. Unfortunately we were not able to walk under the arch but we did get to watch some filming and caught a glimpse of two of the main actors Daniel Radcliff (Harry) and Rupert Grint (Ron). This was an unexpected, happy surprise and a great story thanks to your walking tour! We will be visiting London next month with our two grandsons, and I've been researching Harry Potter tours - as they are (no surprise) big fans. I'd identified a couple of possible walking tours, but also hit the jackpot when I found this site. I clicked on the link and received a fabulous PDF do it yourself walking tour brochure! Well written and illustrated, it looks like a great way to explore London with a focus that will keep the kids engaged. And, we can do it in small bits, rather than in one big "tour". I'm definitely taking this along, and will report back when I return. The "Harry Potter" Tour and London Treasure Hunt is an independent self guided tour that is neither supported by nor endorsed by J.K. Rowling, Bloomsbury Publishing Plc, Scholastic Press or Warner Bros Entertainment Inc.
Richard Jones recognises the fact that all rights to all the "Harry Potter" stories and characters are the property of J. K. Rowling and her publishers and representatives. Film rights remain the property of Warner Bros Entertainment Inc.